What's worst then coming home after a long day and finding out that your cable box is spoilt? No laptop, psp no battery, blogging with my handphone, can't sleep. Called the service centre. No cable for 3 days. TV junkie withdrawal syndrome in a few. Sigh. Sigh. Now what is the better draw? Red carpet with Ms Fox or just driving to the premiere? And brand new international posters from Transformers. Check out the details, if only the toys have the same feel, how is it that the international posters get a full on face shots and the rest of The Americas and us! get the side profiles? I am figuring it out, maybe we just like to be teased. "We work so hard so that we can relax." We earlier heard that Johhny Depp (chichi) was going to play Freddie Mercury in the biopic. Damn, I was so looking forward to that. 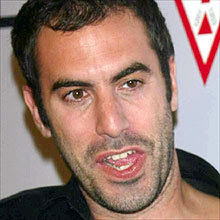 News or rumors just in, producers have just dropped the Captain and looking at signing Sasha Baron Cohen - NICE how much? It may be one of the best studio/media going-to-happen gossip column article next to Paris Hilton's, er, every studio/media going-to-happen gossip column article. How this then: Producers are going after Johnny Depp (Ed Wood, Epic Movie) to play in the new Borat and Bruno (Sasha's flamboyantly gay Austrian fashion reporter) movie, the sequel to last year's highly rated documentary Borat! Cultural Learnings of America for Make Benefit Glorious Nation of Kazakhstan. 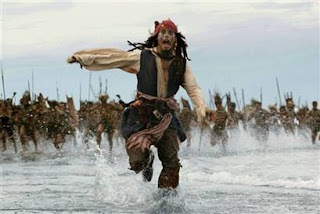 Meanwhile in a tradition of the land-of-dreams turn of events, the role of Johnny Depp in his bopic will be played the multi-award winning Sasha Baron Cohen (Paradise Now), who beat contenders like Ben Stiller (Zoolander) and Vincent Chase (Adrian Grenier's Entourage). 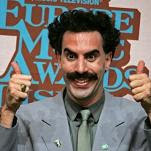 "Borat and Burno" will be produced at USD400 million, making it the biggest film ever. The untitled Johnny Depp biopic is to be made by Singapore film production house Originasian Pictures for USD50, they are in the midst of securing the funding.